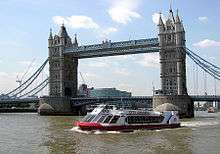 City Cruises is a public limited company that operates scheduled public sightseeing cruises on the River Thames in London, serving Westminster, London Eye, Tower and Greenwich piers every day (except 25 December) throughout the year. It operates the services mainly using purpose-built wheelchair-accessible 'RiverLiner' vessels, which have a large open top deck and enclosed lower saloon with panoramic windows and bars, backed up by some ex-Paris single-deck conservatory-style sightseeing boats. The company also owns a number of other boats with which it provides a variety of private charter and waterage services on the River Thames. City Cruises owns the London Showboat brand, under which it operates an evening dinner, cabaret and dance cruise from Westminster Pier throughout the year, and also owns and operates the Restaurant Ship Hispaniola, which is permanently moored alongside Victoria Embankment close to Embankment Underground station in central London. City Cruises Plc was incorporated in 1986. The current chairman is Gary Beckwith who is also the majority shareholder. In the late 1980s the company acquired former Gosport Ferry boats Vita and Ferry Queen, since sold. In 1990 it also acquired many small ex- Thompson Launches boats. It had been realised since the 1980s that purpose-built boats were needed for operating sightseeing cruises on the River Thames in London but it was not until 1996, following changes to service licensing legislation, that the company's first purpose-built boat, the Millennium of London, was launched followed in 1999 by four new RiverLiners, Millennium City, Millennium Dawn, Millennium of Peace and Millennium Time. Breaking with a river tradition the boats were painted red during the 1990s but this was changed to the current red and white livery with the advent of the RiverLiners. These new boats provided the service to/from Waterloo (London Eye), Blackfriars and the Queen Elizabeth II Pier at the Millennium Dome (now O2 Arena) throughout the year 2000. These same boats transferred to the new Westminster - Tower - Greenwich service from 1 January 2001. City Cruises is now the largest river sightseeing company on the River Thames. In 2002 City Cruises acquired sole ownership of The Yardarm Club Limited, incorporated in 1962, which owns and operates the Restaurant Ship Hispaniola permanently moored alongside Victoria Embankment in central London. In April 2014 City cruises expanded to Poole Dorset with cruises along the Jurassic Coast and around Brownsea island with the boats Solent Scene and Island Scene.